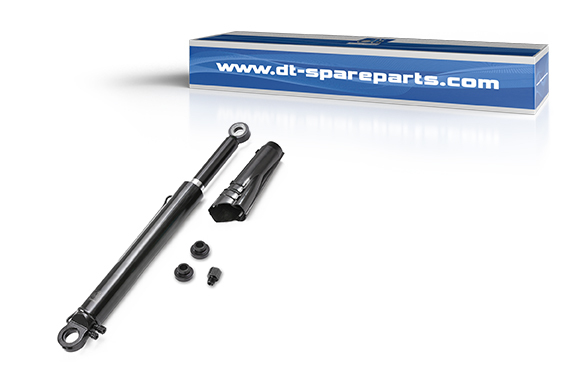 DT® brand hydraulic cylinders consist of a tube with precisely toleranced dimensions, a hard-chrome plated piston rod with very low roughness and high level of hardness as protection against corrosion, as well as a bolted or welded mounting eye or fork. Protection against corrosion of the fixing bolt is ensured by mounted sealing rings. Hydraulic cylinders are used in trucks so that the driver’s cabin can be tilted by approximately 80°. This allows the mechanics free access to the engine, gearbox and related auxiliaries for repair and maintenance. Hydraulic cylinders are basically categorized in two types of design: hydraulic cylinders based on the conventional principal or those based on the regenerative principle. Hydraulic cylinders based on the conventional principal do not have an overflow device and in the retracted unpressurised position they cannot move backwards or forwards. Therefore, in the normal position the cabin is hampered in its suspension performance by the rigid cylinders, resulting in loss of comfort. Hydraulic cylinders based on the regenerative principal have a groove at the end, allowing the oil in the cylinders to move freely between the oil chambers in the retracted position. Thus the hydraulic cylinder provides the flexibility of the cabin, necessary for the suspension. By means of a safety valve, the lowering of the cabin in the case of a sudden drop in pressure is prevented. This valve is protected by a solid die-cast housing. The O-rings and seal rings arranged inside the cylinder, which are made of Viton, NBR or silicone, as well as the guide rings made of PTFE, ensure high reliability, even under the most difficult operating conditions. The piston rod guides are made of precisely toleranced and hardened steel, with a corrosion resistant surface. Some versions are provided with additional plastic caps to be fitted during installation. These protect the piston rods against damage, dirt, moisture and road salt and thus guard against a premature failure. Depending on the model, additional hydraulic adaptors and mounting components are provided, which enable universal application of the various kinds of cylinders in the truck.